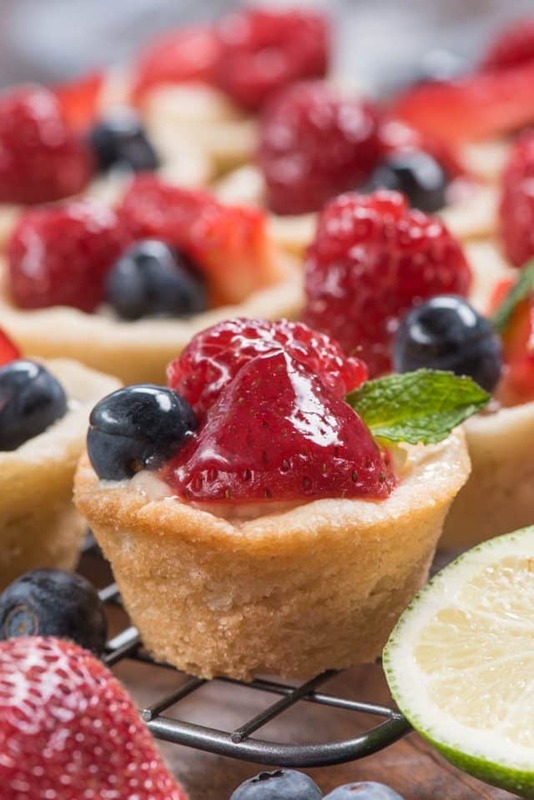 These easy mini Fruit Tarts start with a sugar cookie cup and are filled with a no bake cheesecake and topped with fresh berries and a lime glaze. Make them easy by starting with a prepared sugar cookie dough! I have a thing for mini foods. I love making mini pies, cookie cups, brownie bites, and mini muffins. There’s just something fun and whimsical about desserts that are bite sized…besides the fact they’re so easy to eat. 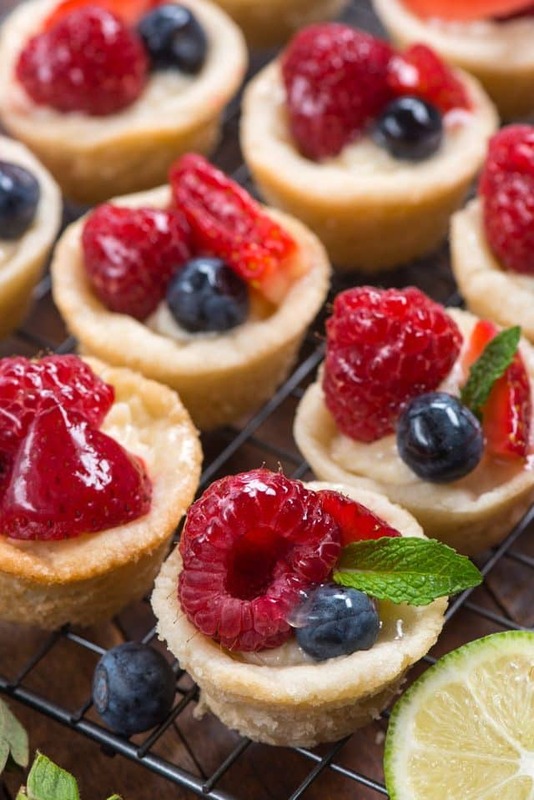 I especially love these mini fruit tarts because they’re SO easy to make. The recipe might have a few steps, but making them couldn’t be easier. And look how pretty they are, with all those berries and that delicious lime fruit tart glaze. I managed to snap these photos after spending 6 hours in the kitchen with a film crew…and then I ate 6 of them right in my office. There are three different components to these delicious mini tarts: a sugar cookie base, no bake cheesecake filling, and a lime-glazed fruit topping. They’re the perfect pretty dessert for any party, Mother’s Day, or even summer and the 4th of July! I’ve got to tell you, I have a serious crush on no-bake cheesecake. I could have just eaten it with a spoon straight from the mixing bowl. Forget a crust or topping, just gimme that creamy deliciousness! But adding a no bake cheesecake to a tart crust makes it even better. I know that traditional tart recipes are made with pastry crust, but I absolutely love using sugar cookie dough instead. It’s easier, especially when you start with Pillsbury or something similar. You can also make the cookie dough from scratch, but sometimes you just need to take shortcuts where you can, especially if you’re spending time making up a filling and a topping. Cut off some time using the pre-made life saver. Then…then it’s time for the filling: no bake cheesecake. Just three simple ingredients: cream cheese, sugar, and vanilla extract mix up nice and smooth, like a cream cheese frosting but lighter. For topping, the sky is the limit. After all, I called these Mini Fruit Tarts, not Mini Berry Tarts…but I just love using berries on top, You could also use mandarin oranges and kiwi or pineapple or anything you love or whatever is in season. To top it off you make a simple glaze that’s super sweet and tart, because it starts with limeade concentrate. The tart cuts the sweet and adds a nice well-rounded flavor to your mini tarts. 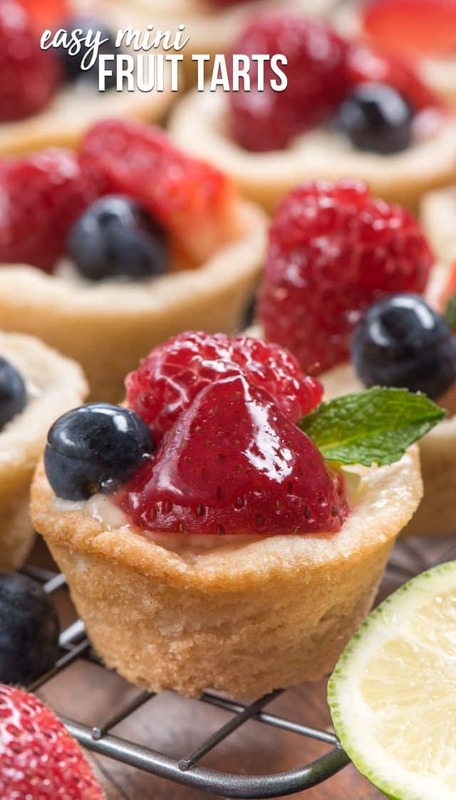 Mini Fruit Tarts are the perfect easy dessert recipe for any party! 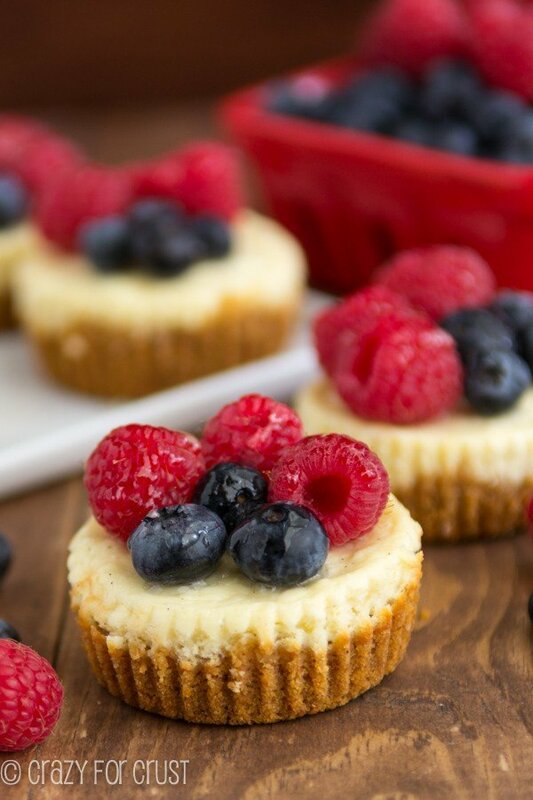 Sugar cookie cups filled with no bake cheesecake and topped with fruit: everyone loves them! If you’re looking for the perfect cute little bite sized dessert, look no further. You’ve found it! For easy release, make sure to spray your muffin tin well with nonstick cooking spray. I prefer the kind with flour. Wait until the cookie cups are COMPLETELY cool before removing them. You’ll most likely have leftover lime syrup. Use it on ice cream or in a cocktail! To prepare ahead: make the cookie cups, glaze, and no bake cheesecake up to 48 hours ahead of time. Assemble once it’s serving time (the fruit only lasts about a day). Preheat oven to 350°F. Spray mini muffin pans with nonstick cooking spray (I prefer using the kind that has flour in it). Place one cookie dough square (or 1 tablespoon cookie dough) in each muffin pan cavity. Bake for 12-16 minutes, or until the cookies are baked through. Cool completely before removing from pan. Tip: for easy removal use a butter knife and run it around the edge of each cookie. Use your finger or the back of a wooden spoon to make an indentation in each cookie to make room for some filling. While the cookies are baking, make the glaze so it has time to cool. In a small skillet or saucepan, add the concentrate, cornstarch, and sugar. Whisk to dissolve the cornstarch and sugar and cook until it boils and thickens, just a few minutes. Remove from heat to cool. Once glaze and sugar cookie cups are done and cooled, make the filling. Beat the cream cheese with sugar and vanilla until smooth using a hand or stand mixer. Assemble the tarts: spoon about a tablespoon of filling into each cookie cup. Top with some fresh berries or other chopped fruit. Brush with the lime glaze. Serve within 3 hours of topping with fruit. You can make all the components of this up to 24 hours ahead and assemble right before serving, if desired. Store filling and glaze in refrigerator and cookie cups in an airtight container. Once assembled, these are best eaten the day they're made. If you love fruit tarts be sure to check out this beautiful Breakfast Fruit Tart, Amy’s Strawberry Fruit Tart, or Becky’s Puff Pastry Fruit Tart! My Mini Fruit Tart Cheesecakes are always a hit! 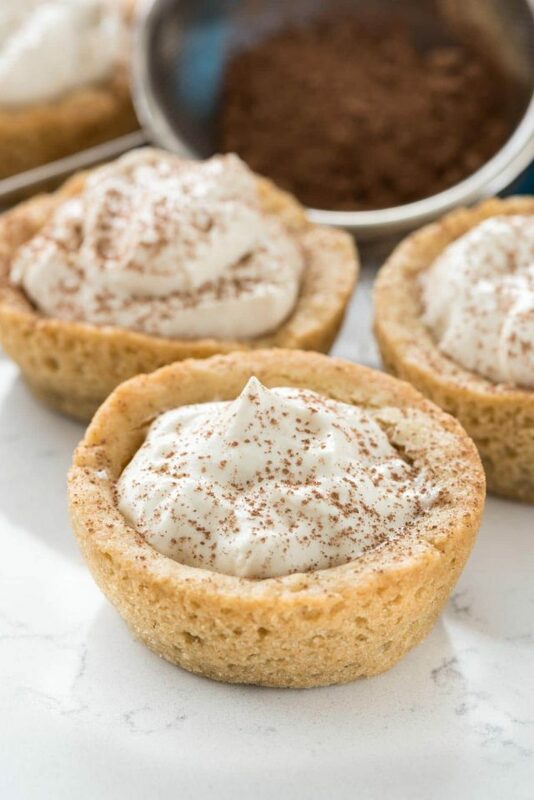 Tiramisu Cookie Cups are another way to use sugar cookie dough! In Australia we don’t have limeade concentrate (or ANY frozen juice concentrates for that matter) – what can I use instead? THanks! Maybe try lime or lemon curd. So pretty and seeing these puts me in the mood for spring and summer fruit! if nothing else, it’s hard to add to many calories in these mini serving sizes, adorable, but how do you stop eating more than one at a time? So lovely ! Perfect for spring ! Thank you ! I love your recipes and they remind me of when I was young and could eat anything I wanted. As a senior I would have to make substitutions as follows: I’d substitute the cookie dough crust for crushed almonds and pretzels, the cream cheese I ‘d substitute blueberry cream cheese and not add extra sugar, and for limeade topping I would trade the sugar for an all-fruit preserves that would complment the lime flavor of the limeade. Totally adorable, and so DO-able! I followed many other recipes for these tarts and they were always Vague about how to do things and I always ended up with a bad tart, and but this helped out so much!!! I struggled with the glaze on other recipes but the video definitely helped with it, I would recommend this to beginners it’s easy and you’ll end up with a good result.